North Kiteboarding Lizard trainer kites are available in two different sizes. The Lizard 1.8 and the Lizard 2.5, they both offer a safe and enjoyable way for newcomers to learn the basics of kite flying, before they progress onto their first lesson on the water. Durability is paramount when you are learning to fly a kite, both the Lizards are Ram Air Construction and we have employed new internal construction supports to make the kites bomb proof. The handling on the Lizard is predictable and controllable, enabling new flyers to get to grips with the basic skills quickly. The kites react instantly to input on the bar, allowing the flyer to direct the kite around the wind window with precision and ease. Both Lizard kites are supplied with a 50cm rubber coated aluminium bar, this means you can get the “feel” for flying a kite on the same set up as our kitesurfing kites. The bar has winding posts to allow you to wrap up the lines without tangling them. 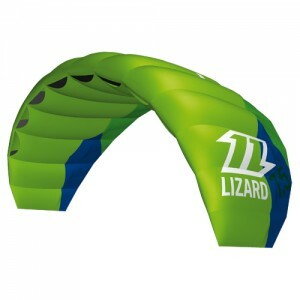 The Lizard kites are ready to fly straight out of the bag, unpack, unwind, launch and ENJOY! Lizard 2.5 inclusive safety leash!